When you travel, what do you remember afterward? I remember the food. I have a better memory of eating quiche Lorraine for breakfast on a bench by the Seine in Paris than I do of seeing the Mona Lisa in the Louvre. Of course I remember the big‐name sightseeing highlights, but I also remember the Nutella and banana crepe we bought from a stand near the Eiffel Tower; a brioche aux praline in Lyons that was so good we changed our return travel plans back to Paris just so we could eat it one more time; chocolate mint gelato in Florence served by a man in what looked like a crisp white lab coat and perfectly Brylcreemed 1950s hair; kriek cherry beer in Amsterdam, glögg in Copenhagen and a harsh, peaty whiskey in Edinburgh that I downed after (foolishly, in my case) taking the ghost tour of the city; conch chowder in the Bahamas; hot chocolate and a gingerbread man with my little girl in London; and a ploughman’s pub lunch in Canterbury. In Barcelona we spent more time eating tapas and drinking sangria than sightseeing. In the US, I still have clear memories of bratwurst being grilled on the Memorial Union Terrace in the summertime in Madison, Wisconsin; whole crabs in Baltimore, complete with a newspaper‐covered table and hammers; lobster in Boston with flimsy plastic bibs and pitchers of beer; a post‐wedding brunch at the Ritz in Washington, DC with scallops and bacon, caviar and waiters who seemed to top up my glass of mimosa after every sip; sopapilla and honey in Santa Fe; scoops of ice cream in waffle cones so freshly made on the spot in Bellingham, Washington that they were still warm; and a nondescript hot dog somewhere outside of Charlottesville, Virginia that I remember only because I couldn’t understand a single word the man behind the counter said when he rattled off all the toppings because his Southern accent was so thick, so I just said I’d have what my friend was having. As for this salad, I had it for lunch on a rooftop café in Tuscany on my honeymoon eight years ago, looking out over rolling countryside that was hazy in the middle of the heat wave they were having at the time. Earlier during that trip, walking across the city on our way to stand in line in the hot sun for an hour to see Michelangelo’s David in Florence and wilting just at the thought of it, I turned to my husband and said, “Will seeing David really make us better people? How about we just go back to the garden at the hotel and drink beer and eat olives instead?” Which is exactly what we did. What are some of your memories of food and travel? To make the dressing, first crush the garlic and salt using a pestle and mortar until the garlic is pulverized into a paste, then work in the mustard powder and pepper. If you have a large pestle and mortar, add the olive oil, lemon zest and juice directly into it and whisk everything together thoroughly. If your pestle and mortar is small (like mine), then scrape the garlic paste into a larger bowl and whisk in the olive oil, lemon zest and juice in that. Place the beans in a bowl and pour the dressing over, stirring to make sure all the beans are coated. Season generously. 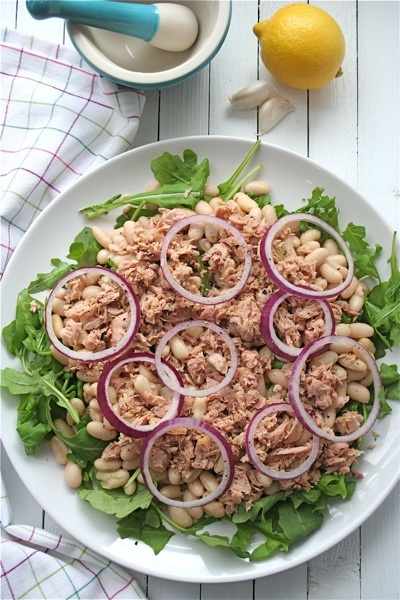 To serve the salad, arrange three‐quarters of the arugula (rocket) leaves over the base of one large serving dish (or you could assemble the salad on individual plates), spoon the beans on top and add the tuna fish in chunks. 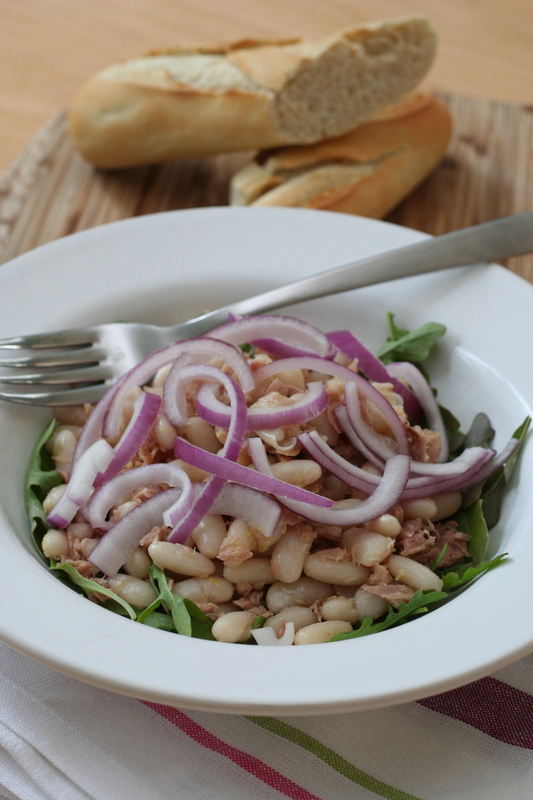 Add the rest of the arugula, pushing some of the leaves and chunks of tuna right in amongst the beans. Arrange the onion slices on top and serve straight away.